I couldn't remember what type and then I finally found a picture. Then I found this site called www.georgiavines.com and I was really in trouble. I just bought the p. triloba. It is supposed to be a HUGE vine up to 30 ft....and FRAGRANT. I think my back garden is going to smell like a bordello, what with the nightblooming jasmine, moonflowers, mandevilla, star jasmine, and now extremely fragrant p. triloba. I'm working on getting a ruby glow passionflower. The magenta petals with purple filaments look quite striking. I'm planning to put it on a trellis to hide the pool pump. In front of that I have a raised bed where I'm putting the night blooming jasmine. I need to think of something to plant in front of that. All the flowers in the back garden are in shades of pink, blue, purple, white, and chartreuse. I am more of a "cottage" garden person, but I am starting to slip more and more tropicals in. Alot of the cottage type flowers just don't seem to like our humidity and heat. I try and fight it, but it kind of depresses me watching my lavender plants rotting before my eyes. Two are hanging in there, but I don't know if they have long to live. I'm also trying to get some Aristolochia (dutchman's pipe) vines growing. I've got the seeds and now I'm playing the game of waiting for them to germinate. These are kind of weird flower...they remind me of a pitcher plant, but swallowtail butterflies use them as a host. I've also got some bananna passionvine seeds germinating (I hope)...the flower is such a pretty pink...with a green center. This is my second try...I hope I can get them going. The ruby glow passionflower sounds lovely, you must get a picture when you do get one. I love a scented garden so you are really lucky Anna. I never find that the scents of flowers clash like they do with man-made perfumes. 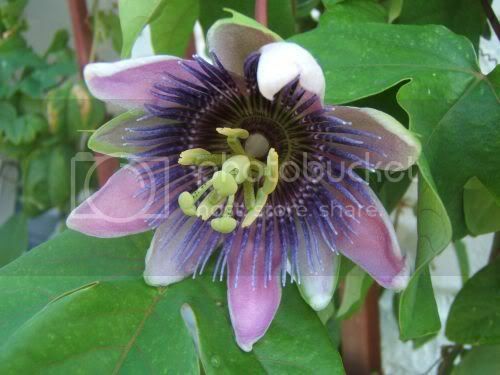 Love the photographs btw - my passionflower is just in bud now. I'm adding a link to some pictures of Ruby Glow. It is incredible. It really does glow! a couple of them .The one that bloomed is purple.The other is suppose to be red.It has not bloomed so far.I do hope it is red .